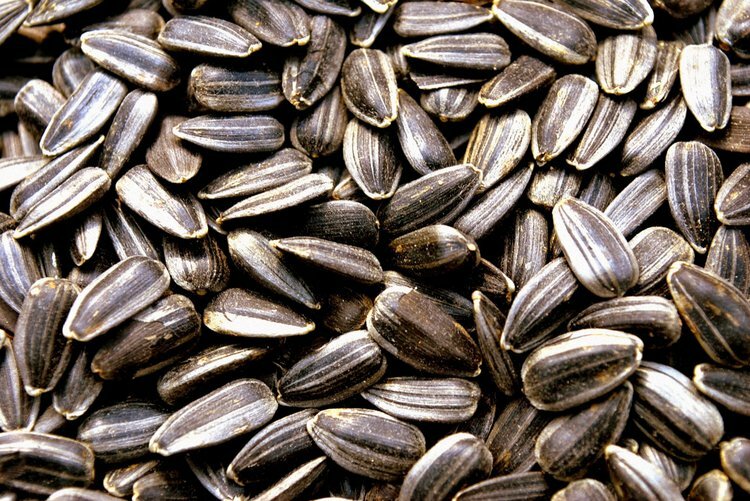 Sunflower seeds are the fruit of the sunflower and have been a traditional snack with baseball players. An ounce of sunflower seeds contain three grams of dietary fiber. The dietary fiber in sunflower seeds could help improve an individual’s digestive health by avoiding constipation and helping their body expel potentially harmful, biological waste products. The high fiber content can help individuals maintain a healthy blood sugar level, especially for those who have diabetes. Individuals who are trying to build strong bones should consume sunflower seeds. Though the seeds are low in calcium, they contain other minerals that are vital for bone structure and strength such as magnesium, phosphorus, and zinc. Inadequate levels of these minerals have been associated with the development of osteoporosis. In addition, magnesium in sunflower seeds can help individuals sleep well by relaxing the blood vessels in the brain. Individuals with sleeping disorders are encouraged to eat foods with an adequate amount of magnesium. The high magnesium content in sunflower seeds can also lower blood pressure, thus reducing the potential for a heart attack or stroke. Sunflower seeds have high amounts of betaine, which effectively fight against heart diseases. Also, the amino acid, arginine, is responsible for a healthy heart. Magnesium, along with the B-vitamin complex, can help enhance energy production. Sunflower seeds contain B-vitamin components like thiamin (B1), niacin (B3), pantothenic acid (B5), and folic acid (B9). Thiamin helps maintain proper nerve health and brain function. Niacin has been known to increase an individual’s HDL or “good” cholesterol and reduce the risk of heart problems. A deficiency of niacin leads to pellagra - a disease characterized by diarrhea, dementia, dermatitis, and insomnia (the inability to fall or stay asleep). Pantothenic acid (B5) is an essential vitamin for carbohydrate, protein, and lipid metabolism in the body. This is particularly useful since sunflower seeds are high in nutritious fats. Folic acid, or folate, (B9) helps the body to produce healthy red blood cells and prevents anemia. It is also essential for assisting in rapid cell divisions and growth such as during infancy and pregnancy. A deficiency of folic acid in pregnant women can lead to birth defects, underweight infants, and may also result in neural tube defects in newborns. Unsalted, roasted sunflower seeds are the best choice when buying sunflower seeds. They have a positive impact on the brain and will help uplift one’s mood. The substantial amounts of fats, vitamins, and minerals contained in sunflower seeds make them an excellent food to help fight brain disorders and heart illnesses. Anderson, J. W., Baird, P., Davis Jr, R. H., Ferreri, S., Knudtson, M., Koraym, A., ... & Williams, C. L. (2009). Health benefits of dietary fiber. Nutrition reviews, 67(4), 188-205. Bazzano, L. A. (2008). Effects of soluble dietary fiber on low-density lipoprotein cholesterol and coronary heart disease risk. Current atherosclerosis reports, 10(6), 473-477. Westerterp-Plantenga, M. S. (2008). Protein intake and energy balance.Regulatory peptides, 149(1), 67-69. Ludwig, D. S., Majzoub, J. A., Al-Zahrani, A., Dallal, G. E., Blanco, I., & Roberts, S. B. (1999). High glycemic index foods, overeating, and obesity.Pediatrics, 103(3), e26-e26. Jenkins, D. J., Kendall, C. W., Augustin, L. S., Franceschi, S., Hamidi, M., Marchie, A., ... & Axelsen, M. (2002). Glycemic index: overview of implications in health and disease. The American journal of clinical nutrition, 76(1), 266S-273S. Manwaring, W. H. (1945). Nutritional Value of Sunflower Seed. California and western medicine, 63(3), 112. Škrbić, B., & Filipčev, B. (2008). Nutritional and sensory evaluation of wheat breads supplemented with oleic-rich sunflower seed. Food Chemistry, 108(1), 119-129. Pedrosa, M. M., Muzquiz, M., García‐Vallejo, C., Burbano, C., Cuadrado, C., Ayet, G., & Robredo, L. M. (2000). Determination of caffeic and chlorogenic acids and their derivatives in different sunflower seeds. Journal of the Science of Food and Agriculture, 80(4), 459-464. Bailly, C., Benamar, A., Corbineau, F., & Côme, D. (2000). Antioxidant systems in sunflower (Helianthus annuus L.) seeds as affected by priming.Seed Science Research, 10(01), 35-42. Shewry, P. R. (2007). Improving the protein content and composition of cereal grain. Journal of Cereal Science, 46(3), 239-250. Halvorsen, B. L., Holte, K., Myhrstad, M. C., Barikmo, I., Hvattum, E., Remberg, S. F., ... & Moskaug, Ø. (2002). A systematic screening of total antioxidants in dietary plants. The Journal of nutrition, 132(3), 461-471.